It's Writing Wednesday. Have you ever had a problem finding just the right title for a story you have written? That's a title problem, right? Maybe not. It may actually be a story problem. If you're really stuck finding something that fits, it may be that there is something missing in the story. It may need more focus. It may need a stronger "hook" to intrigue the reader. It may need stronger emotional content--maybe it's a little bland. Titles often are based on the character, the story conflict, and/or the setting. 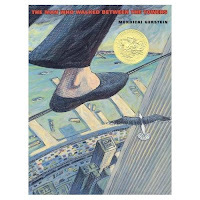 (The Man Who Walked Between the Towers seems to hit all three.) In a picture book we need to have strong elements in the story to be able to pull out a title that draws readers in. When they see the name of your book, they should think, "Gee, I wonder what happens in that book?" So if you're having trouble with a title, look again at how you can intensify the story itself. Can you think of a picture book that has a really good (reader motivating) title?